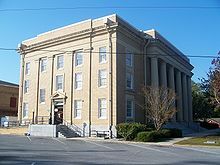 Washington County is a county located in the state of Florida. As of the 2010 census, the population was 24,935. Its county seat is Chipley. Washington County is a prohibition or entirely dry county, meaning that the sale of alcoholic beverages is banned in the county. Named after George Washington,  the first President of the United States of America, the area was first settled by those seeking both economic and political freedom in this frontier land of vast timber and mineral resources. Inland waterway transportation brought about heavy river settlements. The arrival of railroads in the late 1800s boosted economic, social and political developments. As of the census  of 2000, there were 20,973 people, 7,931 households, and 5,646 families residing in the county. The population density was 36 inhabitants per square mile (14/km2). There were 9,503 housing units at an average density of 16 per square mile (6/km²). The racial makeup of the county was 81.72% White, 13.69% Black or African American, 1.54% Native American, 0.36% Asian, 0.06% Pacific Islander, 0.58% from other races, and 2.05% from two or more races. 2.30% of the population were Hispanic or Latino of any race. Dry counties Washington is a partially dry county. Alcohol cannot be bought or sold on Sunday within the city limits of Chipley. Vernon, Ebro and Wausau are excluded from this ordinance. ^ Publications of the Florida Historical Society. Florida Historical Society. 1908. p. 35. ^ District, Washington County School. "Schools". Archived from the original on 2009-05-14. Retrieved 2009-05-26. Wikimedia Commons has media related to Washington County, Florida. Washington County Council on Aging Provides senior and elderly services including meals on wheels, case management, respite, workshops and more to residents throughout Washington County, Florida. UF IFAS Extension Washington County The Cooperative Extension Service is nationwide and was established by the Smith-Lever Act of 1914. It is a partnership between state land grant universities, the United States Department of Agriculture (USDA) and the county governments throughout the nation. In Florida, the Cooperative Extension Service is administered by the University of Florida. Thus, the Washington County Extension Service is a partnership between the USDA, the University of Florida and Washington County government. All of these groups share in the planning, financing, and operation of extension programs in the areas of Agriculture, Horticulture, Family and Consumer Sciences and 4H Youth Development.